• Burn ISO image directly to USB drive or CD/DVD disc. • Make bootable USB or CD/DVD from ISO file. • Free to edit any ISO file and re-pack it to a new ISO file..
• Extract content from ISO file in seconds no matter how large is. • Copy entire DVD disc to local drive in ISO format. 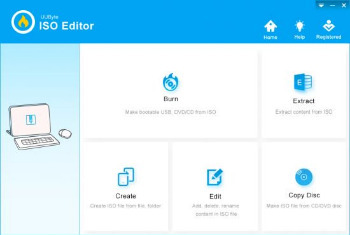 ISO burning is one of the most anticipated features of UUbyte ISO Editor. It allows users directly burning ISO archive to an external media device, including USB flash drive, CD and DVD. The best part of this program is that it can make bootable disk from ISO image so you can use it to rescue the computer or fix system issues. Creating ISO image is quite simple with UUbyte. Customer satisfaction is our first priority so we tried our best to make this function much easier to use comparing to the existing ISO creating programs. Simple drag and drop the files from local computer and click the “Create” button. Done ! An ISO archive is completed in less than 5 minute! Get an ISO image but not finding a way to open or view the files stored in it? There is no application on Windows and Mac that could load ISO file in default. With UUbyte toolkit, you can directly open and extract files from ISO so you can take actions on the ones you need to. The process is straightforward and hassle free! Adding or removing files from existing ISO is a common demand being asked frequently according to online survey. UUbyte has a built-in module to accomplish this task smoothly. You are absolutely free to add or delete files from ISO and re-create the ISO file accordingly after the action. This unique feature is 10 X faster than other similar software with the help of smart file compressing and decompressing engines.